“When I get on the outs,” is a common phrase used in the jail house among us women when we re incarcerated. But more than likely, we forget about all those fantasies we sit and talk about once we are actually out. So, when I thought up this program Sisters That Been There, I had just that in mind — a group that does what they say they want to. Everything in me wanted to keep those happy moments and memories we shared while incarcerated alive on the outs. We would put our commissary together and make a huge yummy spread with ramen, chips, hot water, ham, and nacho cheese. We would get a fresh deck of cards and make a day out of it, spades in front of the tv with our girls surrounding us while making enough food to pass around the group of us. Some days we would be so in to the game we wouldn’t even shower. Yeah, it was serious fun we would say to one another “S.O.S” — meaning spades over showers. We had such a limited time to do all these things that sometimes it was more necessary to have a moment of freedom through a fun experience than to use your time to shower. As we liked to say, use your time on earth wisely, sometimes it important for us to just let go and enjoy the moment. My favorite conversations at the card games were when we would say, “we should do this when we get out.” Everyone was into the idea of it, but not sure how likely that could actually be. I myself was more in love with the thought, so on February 1st, we did it. The girls in Sisters That Been There (who do a weekly session held at the Probation Department) wanted to do a girls night, so we put it together — cards, food, movies, candy, and pop corn by candle light in a safe space provided by Silicon Valley De-Bug. We were able to live out our past day dreams and bring them to the outs, and we not only did this for ourselves, but also for the women who went before us, for those that will never get the opportunity to join us, and of course those who could have been on the outs with us, but are still caught in this cycle. We always want to acknowledge the women who are incarcerated that can not be with us, because with out them there is no us. Never before would I have thought of playing spades as a way of bonding, but for many of us it was just that. 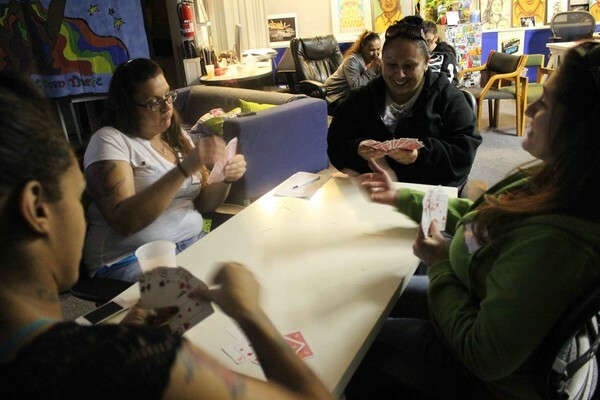 Most of us learned the game of spades while being incarcerated as a way of passing time. It never occurred to us that to play spades on the outs was a confirmation that we all truly enjoy the company of one another. So now and then we can get together have a good time eat even better food and not once think of breaking any laws.